So you've got some money to spend on your class, or you're planning to apply for some using Donors Choose. But what will help make your classroom a better place for you and your students? I see this question a lot inside my Facebook group, Creative High School English. 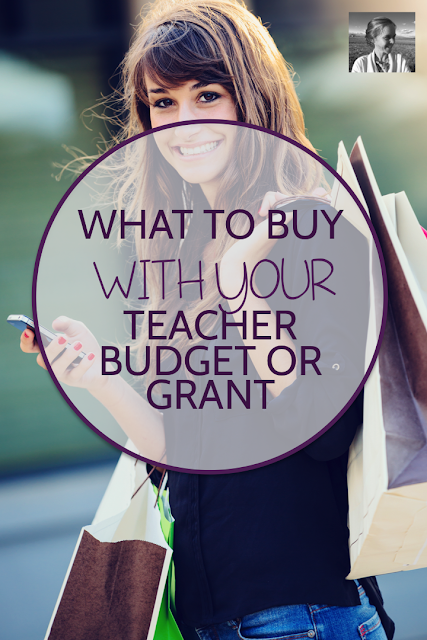 It can be overwhelming to have a block of money you're supposed to spend all at once, and not know what will help your students the MOST. So here are some ideas. 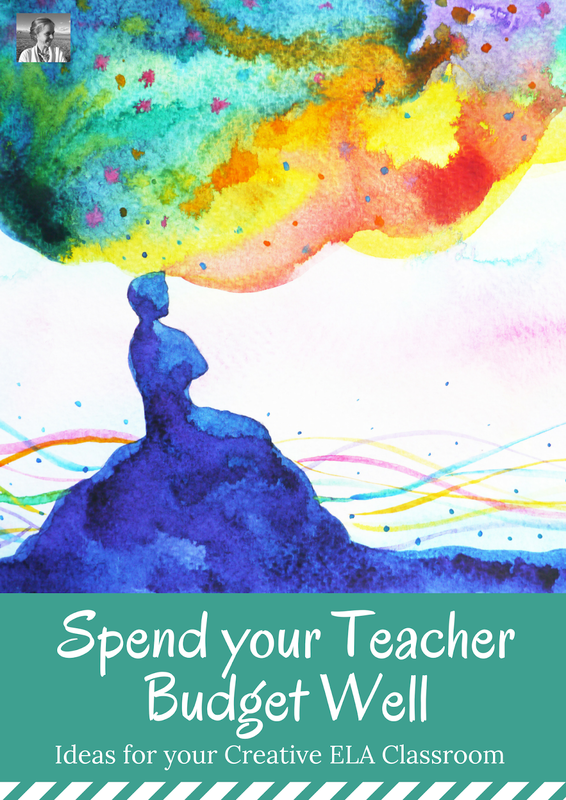 Browse through and consider what would help you to engage, inspire, and motivate your students toward greater heights of creative learning. Every classroom is different, but I've got a good feeling that some of these things will feel right to you. Flexible seating is all the rage across the United States. 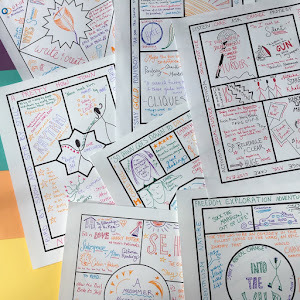 While we usually see it in the form of giant blue bouncy balls and rocking plastic mini-chairs for primary students, secondary ELA teachers are finding their own way. Couches, bean bags, beautiful counters with brightly colored stools, ottomans, shaggy rugs - all of these additions to a classroom can add cozy places for students to fall in love with reading and writing. Check out the way my friend Emily transformed her ELA classroom to a more flexible learning space with less than fifty dollars. More and more, ELA teachers must be the book providers in modern schools. Even if your school has a library, unless it's a truly thriving space that beckons and beguiles students, you're going to have more success getting your kids matched with great books right in your classroom. If you've got some money, here are the ten top titles I'd recommend to start hooking your reluctant readers. You can find a longer list of recommendations here, if you're looking to spend more money on books. If you're interested in breaking into the world of escape rooms as a way to engage your students, getting a Breakout Edu Membership is a way to make it so easy. You get the gear for doing escape rooms, plus access to a bunch of escape room activities that have already been created. You can read more about what escape rooms are and how they work to inspire creative thinking for your students here. Make your classroom a more creative, collaborative, adaptable space with moveable parts. Buy cans of chalkboard or whiteboard paint, mini whiteboards or chalkboards, markers, chalk. Buy post-its for outlining story ideas on foam boards or commenting on gallery walks. Buy art supplies to fill a materials station you can use for ELA makerspace projects, sketchnotes, and one-pagers. I applied for a grant in my first year of teaching for theater props and costumes to use in class, and we loved our theater corner. I spent my one hundred dollar mini-grant on funny clothes, wigs, glasses, and even a little makeup to put on an old shelf in one corner of my classroom, and we had so much fun with it all. Theater props and costumes are a great addition to any reader's theater project, and they also add a lot if you're having your class read a play out loud. You'll be surprised at how much your big kids like dressing up. Screencastify is a great tool for recording videos to help your students and parents. The tool records your screen as well as your voice, so it's easy to use it to go over things. You can record yourself giving feedback to save your commenting time, explaining the steps in a paper or project, giving a lesson plan for a sub day, guiding parents on a tour of your class website, hyperdoc, or grading database, etc. Screencastify is a free tool, but if you want to be able to export your videos instead of link to them, you need the paid version. If you've got budget, that might be nice! If you spend any time at all on teacher Instagram, then you've seen the classroom transformations going on these days. It's possible to switch the look of your classroom quite quickly with the right props - turning it into a coffee shop for a poetry slam, a cafe for a book tasting, or a theater for a play performance. If this idea appeals to you, you could spend some of your money on plastic bins you can label with each type of transformation, and the props that can help you put it into action. That way as the years go by, all you have to do is grab your coffee shop kit and make magic when you want that extra pizzazz for a special event. I can still remember the boring posters in so many of my classrooms growing up. Though their messages were probably positive, their contents were so dull. These days creative teachers are making amazing wall decor over on Teachers Pay Teachers. My favorite secondary ELA decor over there usually comes from The SuperHERO teacher and Building Book Love, but if you start searching, you'll find a million other options too. If you wish your classroom was a bit cozier, you could follow the trend and pick up some homey elements. A colorful rug, lamps, a hot chocolate or coffee station, Christmas lights, pretty shelf liners, and a can of paint are all solid options for making your classroom a place where you and your students feel relaxed and ready to do your best work. If you've wished you could try literature circles, but don't have the class sets to make it happen, this could be a great time to pick some up. Learn more about successful literature circles for big kids here. Well, I think that about covers it! Hopefully you've found some ideas that you're excited about. Of course, if you need tech, that's another way to go and that can quickly use up your budget or grant. But I'm thinking if that's what you want, you know what to get already. If you liked this post, you might like to follow one of my favorite Pinterest boards, "Eye Candy for English Teachers."